Info: parents@keshet.org.au; 0467 508 868. 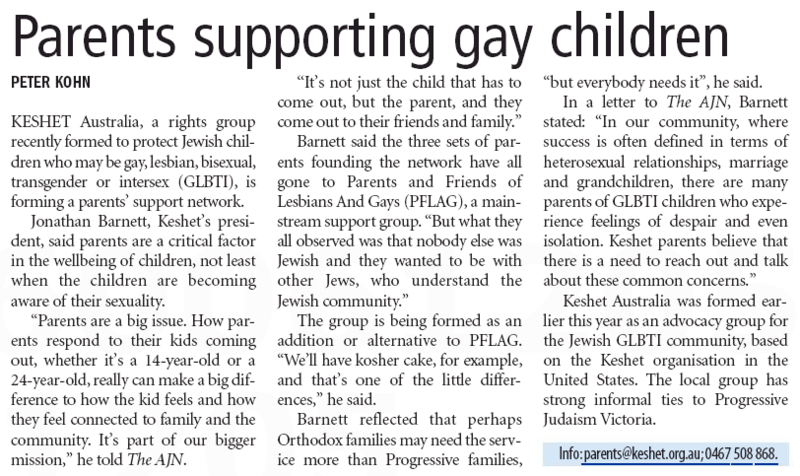 KESHET Australia, a rights group recently formed to protect Jewish children who may be gay, lesbian, bisexual, transgender or intersex (GLBTI), is forming a parents’ support network. Jonathan Barnett, Keshet’s president, said parents are a critical factor in the wellbeing of children, not least when the children are becoming aware of their sexuality. “Parents are a big issue. How parents respond to their kids coming out, whether it’s a 14-year-old or a 24-year-old, really can make a big difference to how the kid feels and how they feel connected to family and the community. It’s part of our bigger mission,” he told The AJN. The group is being formed as an addition or alternative to PFLAG. “We’ll have kosher cake, for example, and that’s one of the little differences,” he said. Barnett reflected that perhaps Orthodox families may need the service more than Progressive families, “but everybody needs it”, he said. Keshet Australia was formed earlier this year as an advocacy group for the Jewish GLBTI community, based on the Keshet organisation in the United States. The local group has strong informal ties to Progressive Judaism Victoria. This entry was posted in GLBTIQ, Health/Welfare, Jewish and tagged Gay, GLBTIQ, Jewish, Jonathan Barnett, Keshet, Lesbian, Othodox Judaism, PFLAG, Progressive Judaism. Bookmark the permalink.